Dr. Melanie Seiler joins us this week as our featured researcher! 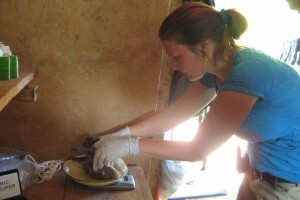 Melanie studied biology at the University of Cologne (Germany) and conducted her dissertation on the social behavior of yellow-breasted capuchins in different European zoos. For her doctorate, she worked with the critically endangered Sahamalaza Peninsula sportive lemur (Lepilemur sahamalazensis) in partnership with the Association Européenne pour l’Etude et la Conservation des Lémuriens (A.E.E.C.L.) in the recently established UN Biosphere Reserve and National Park on the Sahamalaza Peninsula in northwest Madagascar. 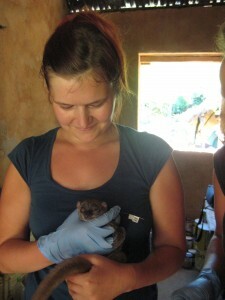 She is currently based at the German Sports University, Cologne, conducting behavioral research on non-human and human primates. Melanie can be contacted at c.xanthosternos@googlemail.com. Working with animals, understanding their behavior, and conserving their natural habitat has been on my mind since I was a child – I always had lots of different pets, and my parents loved to watch various nature documentaries with me. It was always clear to me that I had to study biology, and that’s what I did. About 10 years ago, while I was studying biology at the University of Cologne, I had the chance to study cotton-top tamarins and later yellow-breasted capuchins in the Cologne zoo. Though I loved working in the zoo, I always wanted to observe animals in their natural habitat. I finally got the chance when Christoph Schwitzer offered me a PhD position to help research a newly described sportive lemur species in Madagascar. 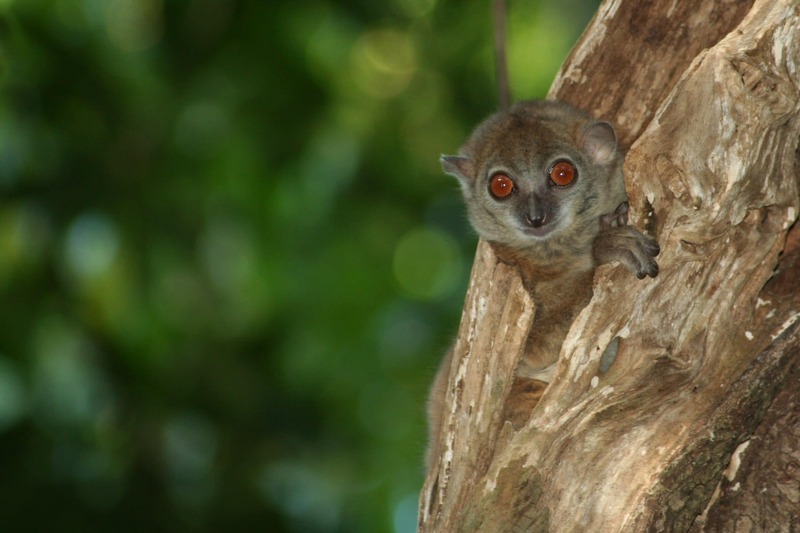 Why is it important to research sportive lemurs? Sportive lemurs cannot be kept in captivity; they die quickly when taken out of nature so there isn’t a back-up population for any of the 26 species of sportive lemurs that we’re aware of. This motivated me a lot. The project was also very exciting as basically nothing was known about the Sahamalaza sportive lemur (Lepilemur sahamalazensis), and very little was known about other sportive lemur species in general. That is a shame as all of the sportive lemur species are highly threatened from habitat destruction and fragmentation. As such, my PhD focused on the influences on habitat destruction and fragmentation on ecology and behavior of this species; this will hopefully help raise awareness for the species. Under what conditions do you live while you are in the field? 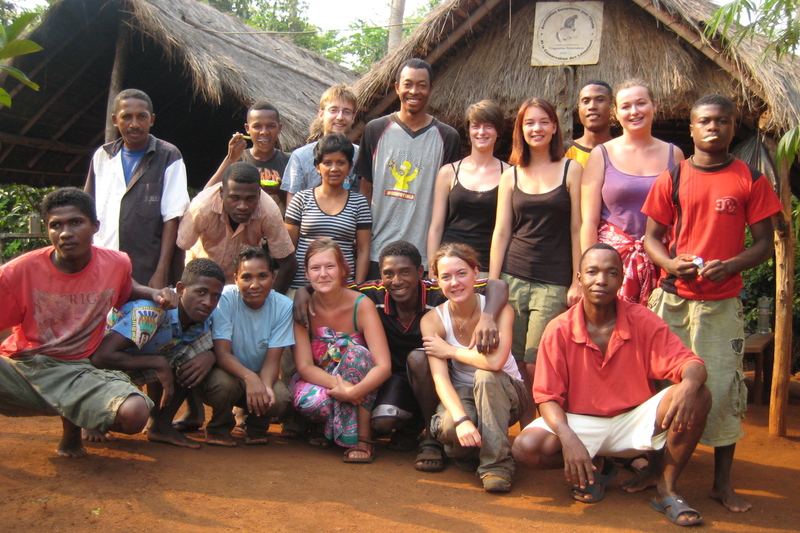 Our research camp, Ankarafa, is located in the Sahamalaza-Iles Radama National Park in the Sofia-Region of north-west Madagascar. The park is a marine and terrestrial protected area established in 2007 and is also a UNESCO Biosphere Reserve. 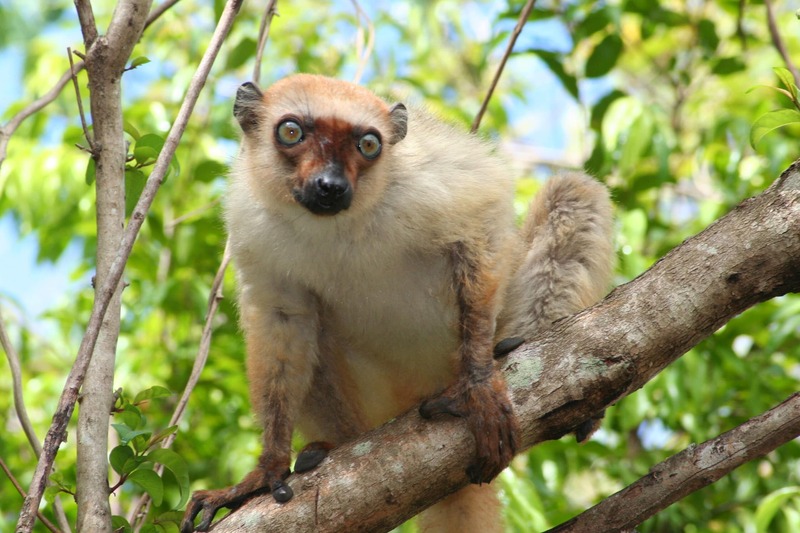 It harbors the last remaining populations of the Critically Endangered blue-eyed black lemur (Eulemur flavifrons) and the Sahamalaza sportive lemur. To get to the research station usually takes several days and starts with 15 to 18 hours in a bush taxi (where you are serenaded for hours by Celine Dion’s top hits). This is followed by hours of additional boat and car rides (with guaranteed car breakdowns) and ends with two hours of walking, mainly uphill, to arrive in camp. 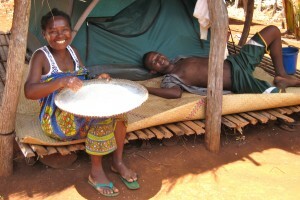 In the research camp we sleep in tents, either on the ground or under one of the wooden roof platforms. This does not sound too comfortable, but is in fact quite nice. Keeping the tent closed, keeps out most mosquitoes and other animals! There is a very basic toilet (pit latrine) that smells really bad – not the most pleasant thing, but you get used to it. Interestingly there are lots of animals around, in, outside, and everywhere within reach of the toilet. It is amazing how much wildlife you can spot there! If you can stand the horrible smell for a while, you do not need to go into the forests at all to see exciting wildlife; you can find all of it at the camp toilet! In terms of food, we eat rice three times a day; plain and watery in the morning and with beans at lunch and dinner. Rice – the main income of the farmers on the Sahamalaza peninsula – is the only food we can buy locally, while everything else has to be brought in from larger cities. Because we do not have a fridge, everything needs to be non-perishable. So, food choices are very limited! During my field stays, pasta with tomato sauce (maybe with some tinned mushrooms) was our Sunday treat, followed by an amazing piece of chocolate. Lastly, there is no proper medical treatment available outside the capital city, and it takes about 1-2 days to reach the nearest hospital. To be on the safe side, researchers have to bring a lot of different medications and need to be able to identify and treat every possible illness that might occur in Madagascar. Getting really ill or breaking a bone are some of the most dangerous things that can happen to researchers in this region. There are a lot of funny memories – mostly because of communication problems – that lead to quite absurd misunderstandings with guides. Once a master’s student wanted to give his guide a day off work, but the guide misunderstood and thought that he had to walk to a village that is about 24 hours away to buy some goods! It took us hours to make it clear that there had been a misunderstanding…it was hilarious! By far, the most memorable event happened during a time when my research team was receiving death threats from villagers. This happened because we always intervened when we noticed that someone was practicing tavy (slash-and-burn-agriculture) in the National Park; this angered some of the local villagers who threatened to burn down the camp and attack our guides. Of course this was a serious situation, and we had to ask the park authorities and police to intervene. During the ensuing days, as we were waiting for the authorities to arrive, we noticed another fire…this one quite close to our camp. I knew I couldn’t ask my guides to help put out the fire; the danger was too great, both because of the existing threats from the local villagers and because the fire was quite dangerous itself. However, despite this risk, the guides volunteered to help us fight the fire; the solidarity that my team and my guides showed in this moment made me really proud. What are the biggest threats facing lemurs in your line of work? Unfortunately, the remaining forest of the Sahamalaza Peninsula and its unique fauna are in grave danger of disappearing. 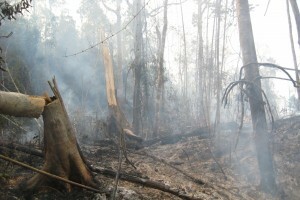 The local forest is already extremely degraded through the bush fires and tree-felling that are routinely practiced and accepted within the local society. These activities have even increased in recent years, probably due to the unstable political situation and resulting poverty in Madagascar. 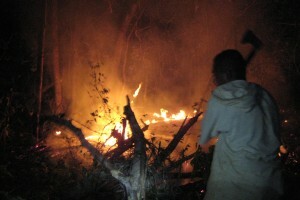 During my fieldwork between 2009 and 2011, stopping bush and forest fires was a regular activity. 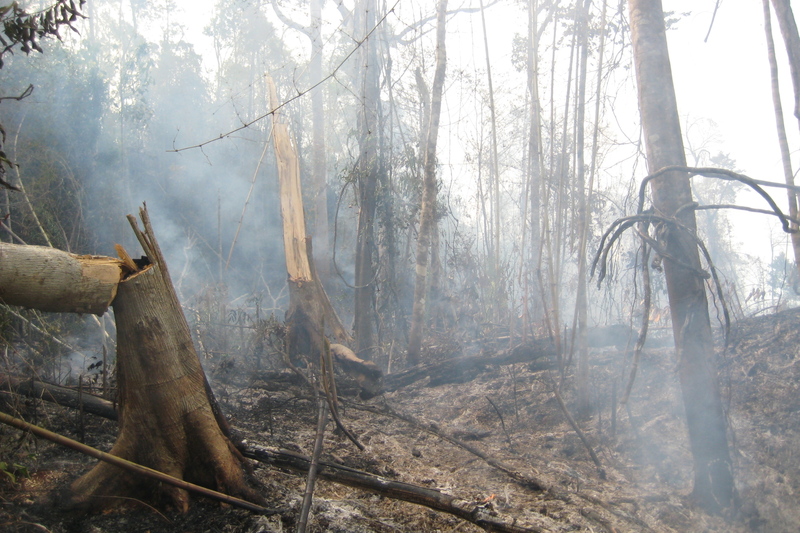 Often the fires had been started by local villagers; sometimes to demonstrate their dissatisfaction with the recent establishment of the national park or because of continued slash-and-burn agriculture. 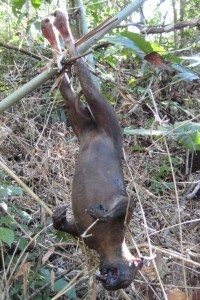 In addition to the habitat degradation, the lemurs of Ankarafa are subject to increasing levels of poaching. We saw evidence of poaching relatively often, such as in 2010, when we discovered logging and hunting taking place only about 200 meters away from our research camp. When we arrived, we smelled fire and saw two young men sitting beside a felled palisandre tree, who quickly left once they realized that one of our guides could identify them. 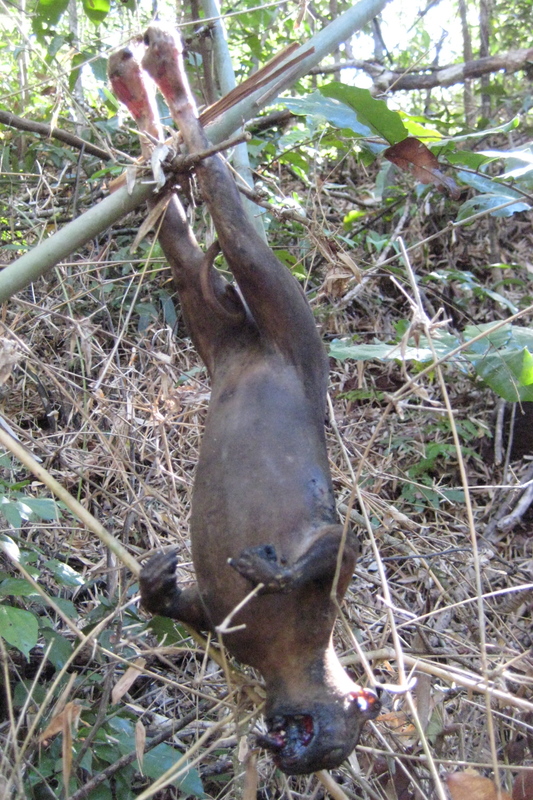 It didn’t take long to see that they had felled numerous trees for the illegal timber trade but were also in the middle of cooking a female sportive lemur, which was hanging from its feet above a little fire. We immediately informed the authorities and hoped that they could and would take action, as we gave them names and the place of residence of the poachers. In 2012, scientists and conservationists working all over Madagascar came together in a IUCN meeting to update the IUCN red list status for all lemur species, and to come up with a plan for their conservation. Talking to other scientists made us all realize how bad the situation really is; about 91% of all lemur species had to be listed as either vulnerable, endangered, or critically endangered. Urgent actions need to be taken to save Madagascar’s wildlife from extinction. Therefore, during this meeting a strategy for the conservation of lemurs was developed, including budgets for the most important hot spots for conservation in Madagascar. For Sahamalaza, we came up with a variety of different actions that will help to save this unique habitat, which will be conducted under the lead of A.E.E.C.L. and Madagascar National Parks. As the presence of the A.E.E.C.L. research station already offers protection to the forest fragments surrounding the station, we propose to establish additional field stations in two other larger forest areas on the Sahamalaza Peninsula. As part of our proposal, station managers (who would be local people) would monitor lemur populations and work with both students and researchers to further the existing knowledge on Sahamalaza’s lemurs. In addition, park wardens would enforce bans on additional habitat destruction, fire breaks would be built with the help of the local community, tree nurseries would be started to help reforestation efforts, and eco-tourism would be fostered to help provide income for local villagers. Of course, outreach and the provision of alternative livelihoods is key. 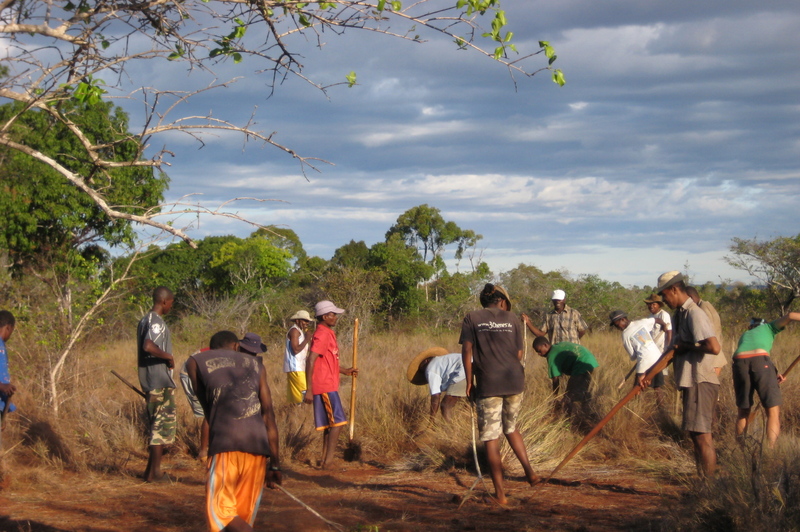 The local communities need to understand why it is so important to save the remaining forest areas, both for lemurs and for the wellbeing of the communities themselves. As such, primary and secondary school teachers (whose salaries are already subsidized by A.E.E.C.L.) will be trained to deliver conservation education lessons to their students. 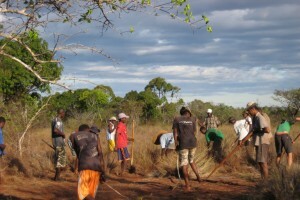 To include all villagers in the program, meetings will be held with the leaders and elders of all villages surrounding the protected area, where the needs of the local human population will be discussed, and people will be updated about ongoing and future conservation work in their areas. Finally, chicken and duck breeding programs as well as bee-keeping initiatives would be implemented as well. This work will not be accomplished without the help of the public. The lemurs of this area need your help and support to make a difference. Right now, people don’t consider sportive lemurs as very beautiful or special; they are cute but they don’t have blue eyes like blue-eyed black lemurs or a huge finger like the aye-aye and obviously, this makes fundraising really hard. In order to survive, these lemurs need your support. Check out the AEECL and Mikajy Natiora organizations, who work in the Sahamalaza region. Support an organization that works to conserve the Sahamalaza sportive lemur!